Airbus’s massive Belgua XL has arrived at the company’s site in Bremen, Germany to perform loading and unloading tests as part of its validation and certification. The Beluga XL is a modified version of the A330 freighter. Airbus is making five of the aircraft to carry completed sections of aircraft from different production sites around Europe to the company’s final assembly lines in Toulouse, France and Hamburg, Germany. 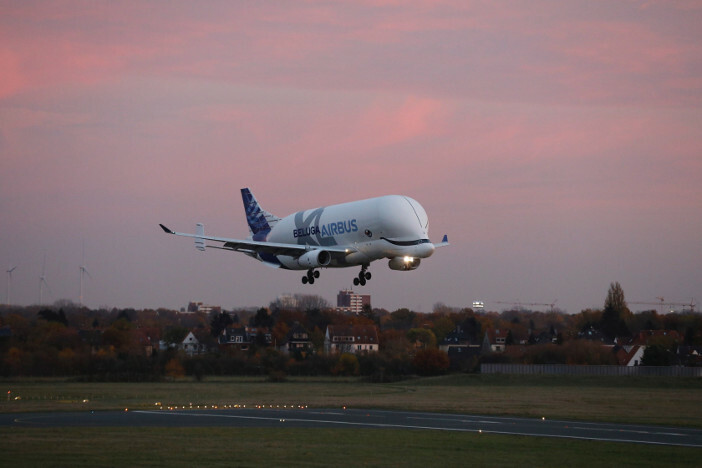 The Beluga XL that landed at Bremen Airport was piloted by Airbus pilots Karl-Heinz Mai and Bernardo Saenz-Benito, who were joined by flight test engineers Jean-Michel Pin and Philippe Foucault, as well as loadmaster Jean-Paul Tarantola. The Beluga XL’s flight test campaign began on July 19, 2018 from Airbus’ Toulouse, France headquarters and is expected to start regular operations before the end of 2019. They will replace the Beluga STs the company currently uses, which have been in service since 1995. With a length of 63m (206ft), the Beluga XL is approximately 7m (23ft) longer than the Beluga ST and incorporates a highly-enlarged cargo bay structure and modified rear and tail section. The Beluga XL fleet will increase Airbus’ air transport capacity for the company’s industrial network by about 30%, said Airbus.